How many of you have an issue to forget your mobile phones? I guess, most of us. Sometimes in our homes, sometimes in our offices, sometimes in our cars and sometimes we even don’t remember the exact place where we left our phones. Instead of searching your phone everywhere, just ask Google where your phone is, and the search engine giant will answer you the exact place where you left your smartphone. Google unveiled a new feature on Wednesday that lets you search for your Android smartphone or tablet using the search engine on your desktop computer. Log-in to the same Google account on your desktop computer’s browser that you use on your Android smartphone, but before that make sure you must have the latest version of the Google app installed on your smartphone. 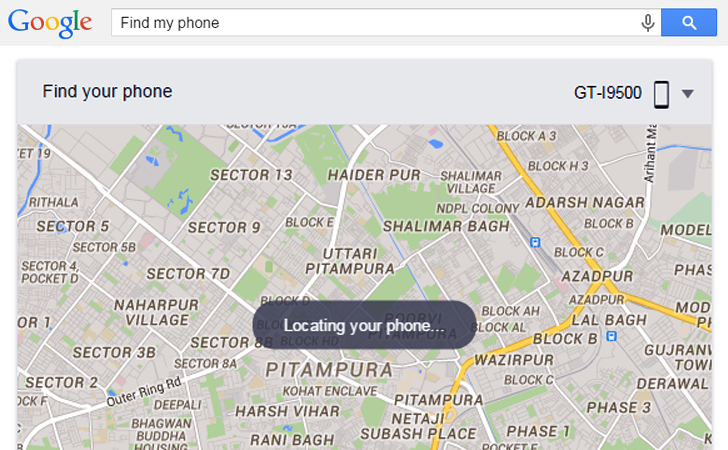 Now type "Find my phone" into Google's search engine, and that’s it. As soon as you press the enter button, Google will display a map that eventually shows you a location on the map that is accurate to a certain distance, as for example, the map showed me the location of my smartphone was accurate to 35 feet. However, what if your phone is not visible to you? Google also offers you a Ring button on the map in order to pinpoint your phone. You just need to click on Ring icon and the search engine giant will ring your smartphone at full volume for up to five minutes. Moreover, once you hand on it, simply press the power button to turn off the ringing. ...a similar feature known as Android Device Manager can also help you locate and ring your Android devices. Also in case your Android device has been stolen, this feature helps you to factory reset your device remotely and reset the password if the device is recovered or erase its data. Apple also offers a similar tracking feature, known as Find My iPhone, that helps iOS users to track down their missing iPhone or iPad, remotely locate its exact location by ringing, lock it and erase its data.